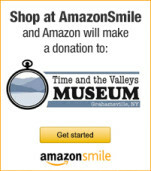 Time and the Valley’s Museum and all exhibitions are handicapped accessible. We are committed to making our facilities, exhibitions and programs accessible for all audiences. Service Animals – Service Animals are welcome in the building and on the grounds. Weelchair Accessibility – Entrances are accessible to wheelchair users. An elevator is located in the building to facilitate access to the upper and lower levels. A wheelchair is available for visitors that may require one.